I had a great day yesterday at The Makeup Artist Studio! As some of you already know, from my earlier blogs, one of my New Year’s resolutions this year was to train to be a makeup artist… I’m pleased to report that this resolution is going strong 💪🏼 I’m studying at The Makeup Artist Studio on Bold Street, in Liverpool, on their Fashion & Photographic course. Doing this course is one of the best things I’ve ever done, I look forward to every Saturday at the studio, not just because I’m a huge makeup geek 🤓 but because I get to spend the day with an amazing group of girls. Each week is like a girly slumber party … music on ✔️ Pin-curls in ✔️ practicing makeup on each other, ready for our Saturday night’s out afterwards. 👸🏼 It’s such a great atmosphere! 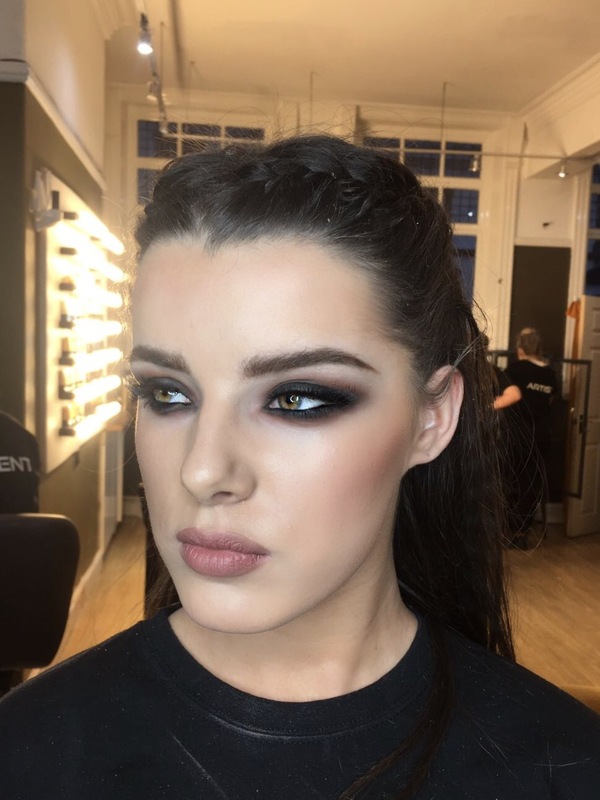 Each week we look at new techniques, learn about the latest trends and get to try out all of the latest makeup products; it’s such a hands on course, so my skills and confidence are growing each week. The classes are lead by a team of ridiculously talented artists, all of which are so friendly, encouraging and supportive, shout out to them all 🙌🏼💕 They all take it in turns to lead the demo’s, which is great because they all have years of experience from all different professional artistry backgrounds, so we get to see so many different techniques. Their knowledge and skills are so inspiring, I’ve learnt so much from them all already. Yesterday we focused on black smokey eyes and I got to work on this gorgeous face 👇🏼 I really enjoyed recreating the demo which Sam gave, What do you think? If you’re thinking of training to become a freelance makeup artist or if like me you just have a serious makeup addiction and want to learn as much as you can so that you can look magically flawless everyday with minimal effort, then I highly recommend this course. The team of leading artists there are fantastic, ridiculously talented and amazing tutors.